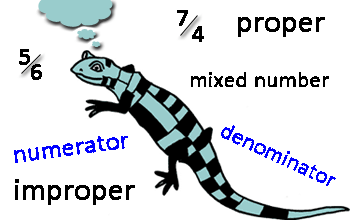 Welcome to our Adding Improper Fractions support page. Here you will find some helpful support to help you learn how to add two improper fractions. If you just want a calculator to do the hard work for you, then try our Adding Fractions Calculator. The calculator will add any two fractions (proper or improper). The great thing is that it will also show you all the working out - job done! If you would rather learn how to do this for yourself, then ignore this part and keep reading. Students are taught about adding and subtracting fractions with like denominators at the 3rd grade level, and with unlike denominators around 5th grade. Here are 2 easy steps to help you add two fractions together. Step 1: Convert the fractions to the same denominator. If the fractions already have the same denominator, you do not need to do anything! Step 2: Add the two numerators together (and keep the denominator the same) to get the answer. You should now have the answer to your fraction sum! You may also need to simplify the fraction at the end. See below for a step-by-step breakdown of how to add fractions. If the fractions already have the same denominator, skip the rest of this part. If the fractions have different denominators, keep reading! We can only add fractions together if they have the same denominator. It is a bit like when you are adding inches and centimetres together - you need to convert both measures to the same units - either centimetres or inches! 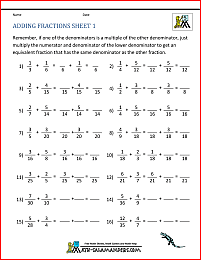 Step 1a) If one of the denominators is a multiple of the other denominator. If this is the case, you just need to multiply the numerator and denominator of the fraction with the lower denominator so that the two denominators are the same. Step 1b) If one of the denominators is not a multiple of the other denominator. The easiest and simplest way to convert the two fractions to equivalent fractions with the same denominators is to multiply the numerator and denominator of each fraction by the other fraction's denominator. Once the two fractions have the same denominator, we can add the numerators together. This will give us the answer we are looking for. Have a look at the examples below to see how it all works! You will notice that the two denominators are identical so we can go straight on to Step 2). We just need to add the two numerators together, and simplify the fraction at the end. So we need to multiply the numerator and denominator of the first fraction by 3. Now the denominators are equal, all we need to do now is to add the numerators together. The denominator of the first fraction is 7. The denominator of the second fraction is 4. These numbers are not multiples of one another. So we multiply the numerator and denominator of the first fraction by the second fraction's denominator (4). Next we multiply the second fraction's numerator and denominator by the first fraction's denominator (7). Step 2: add the two numerators and keep the denominator the same! First we convert the two fractions to the same denominator by multiplying the numerator and denominator of the first fraction by d, and the numerator and denominator of the second fraction by b. Since bd is the same as db, we now have two fractions that are equivalent to the fractions we started with, and have the same denominator! If you would like to see this all in a little more detail, please print out the three sheets below which will tell you all you need about adding two fractions. We have a range of worksheets available for you to practice the skill of adding improper fractions. The sheets start off easier and gradually get harder and harder. Sheet 2 - as for sheet 1, but fractions need simplifying. 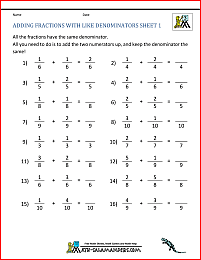 Sheet 1 - adding improper fractions with one denominator being a multiple of the other, e.g. 6/5 + 17/15. Sheet 2 - adding two improper fractions with different denominators, no simplifying needed. Supported. Sheet 4 - as for sheet 3) but fractions need simplifying. Sheet 5 - as for sheet 4) but fractions need writing both as improper fractions and mixed fractions. Sheet 6 - as for sheet 5). Here you will find a selection of Fraction worksheets designed to help your child understand and practice how to add and subtract 2 fractions. Before your child tackles adding and subtracting fractions, they should be confident with equivalent fractions. subtract 2 fractions with different denominators. All the Adding Subtracting Fractions sheets in this section support the Elementary Math Benchmarks for Fifth Grade.